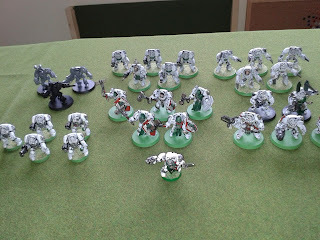 Having picked up the new 7th edition Dark Angels codex at the weekend (love that new codex smell! 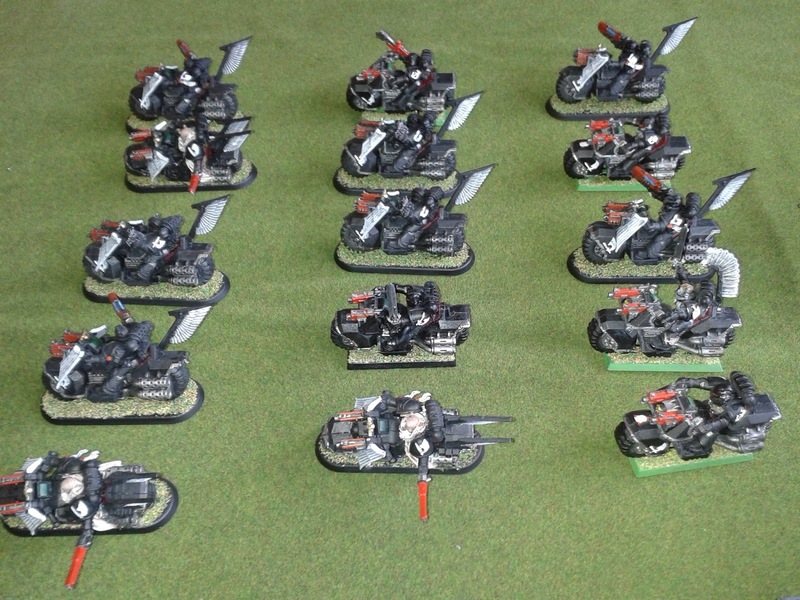 ), I thought I would review one of my favourite armies from the book, the Ravenwing. 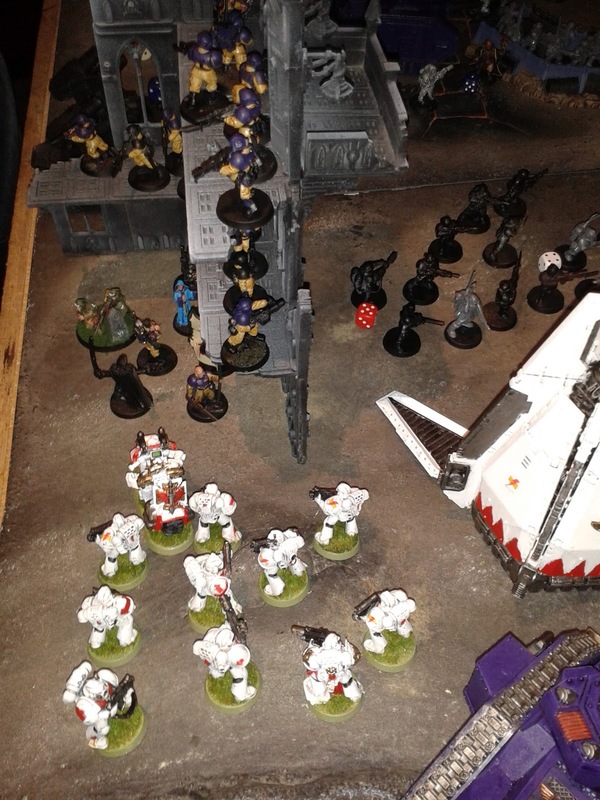 I have always loved the Ravenwing, but they suffered a little bit in the 6th edition codex, being outclassed by White Scars chapter tactics in the Space Marine Codex. 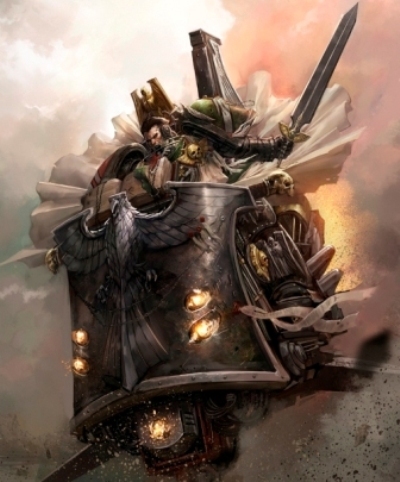 With the new 7th edition Codices out, the Ravenwing have improved significantly, maybe even being better than their White Scars brethren in some respects. 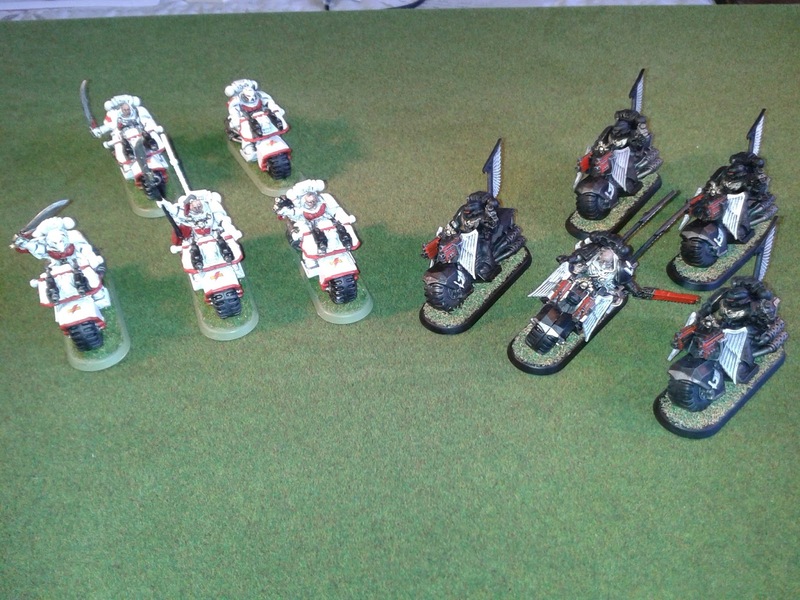 This review will go through the units available to the second company and how they have changed with the new codex. One big change to the Ravenwing in the new codex is that they now have their own special rule (which causes some problems with the formations, as we will see later). This allows any models bearing this rule to re-roll any failed Jink saves. This is quite a powerful ability, as it means that a Ravenwing biker will pass a Jink save 75% of the time, on average (compared to 67% for the next best thing, White Scars biker). 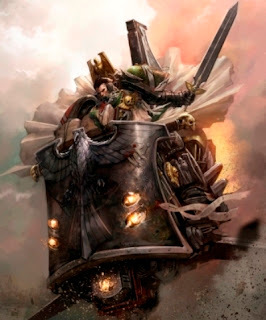 This ability even applies to the Ravenwing vehicles that can be fielded, giving them a bit more protection from enemy fire, albeit at the expense of their firepower. Not even White Scars skimmers gain this benefit, as the skilled rider bonus applies only to bike squads. All Ravenwing bikers (Command squads, Black Knights and regular bikers) get Scout and Hit and Run as standard. Scout is a great special rule, allowing your battle line to rapidly redeploy to close with the enemy quickly or change your deployment, and will even allow units to Outflank; very handy for getting to the weaker side or rear armour of enemy vehicles without having to cross the board. Hit and Run is great for getting your bikers out of unfavourable combats or allowing them to charge in once again (after firing at the enemy unit of course). They also come with Teleport Homers as standard; great for your deep striking Deathwing support units, but not so useful in a pure Ravenwing army. I took a little break from Arkham Knight to do a little hobby work today. The first task was to rebase some of my Ravenwing bikers. 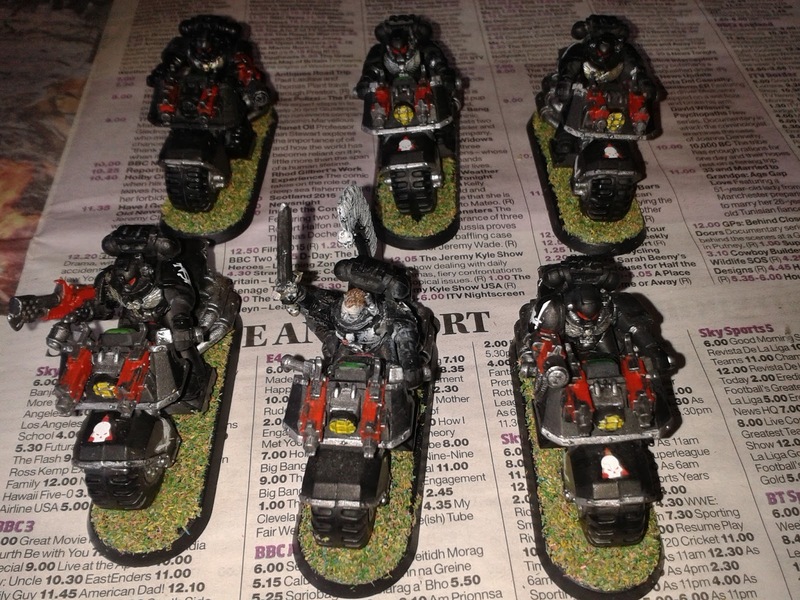 The bikes originally had square cavalry bases, but I swapped them out for the bike bases and flocked them to match my over Ravenwing bikers. Its time to pit the premier bike units of the 40k universe against one another. Its bike vs bike, (super)mano a mano. 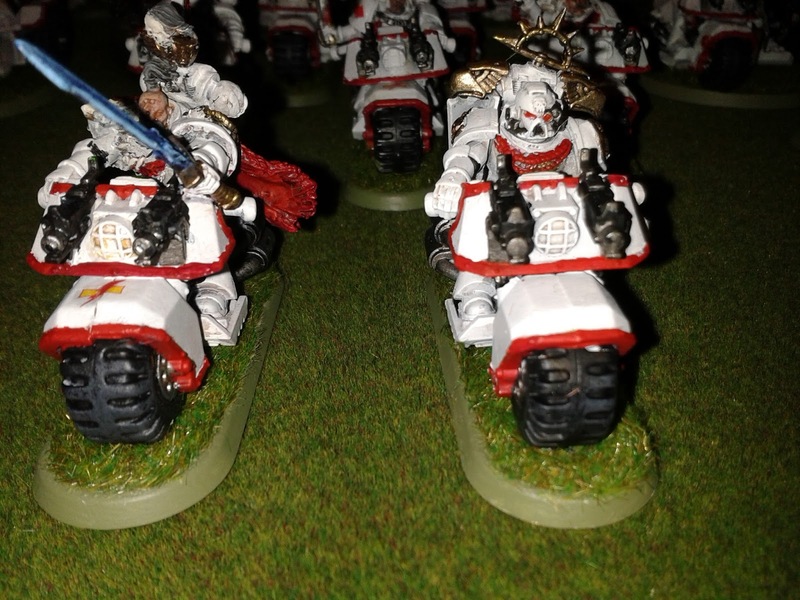 With the recent release of both the Space Marine and Dark Angels codices, I thought I would take the opportunity to compare the two most pre-eminent bike-mounted units amongst the Adeptus Astartes; the Ravenwing and White Scars bikers. I will compare both units based on some random criteria I just made up in my head right now. Inspired by the frugal gaming posts on Warhammer 39999, I decided at the start of the year to record my spending on wargames. I primarily wanted to do this in order to determine how much I was spending on my (sometimes expensive) hobby. You can see the page above for Hobby costs 2015, where I will be keeping track of how much I am spending each month on things to do with wargaming. 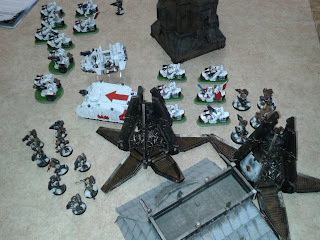 Today, I have a written battle report for my 1850 pts White Scars vs Space Marines from a blog wars tournament practice game. I arrived for blog wars on the Friday night and met up with Luke, Peter and Daniel for some practice games. I ended up playing Luke's Howling Griffins Space Marines using the third blog wars mission (a modification of the maelstrom deck). As it was, on the day of the tournament, I once again ended up playing Luke in the third mission yet again! 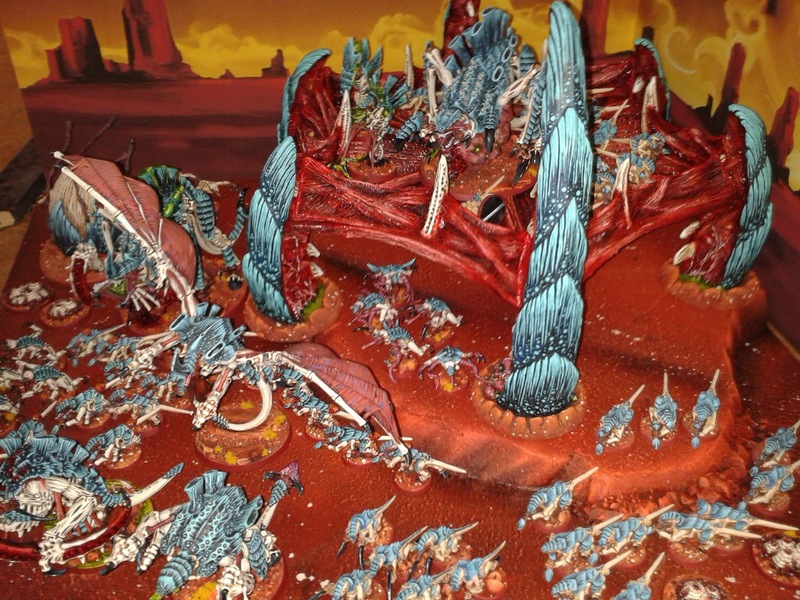 (Blog wars battle report 3). This practice game helped to adapt my tactics for the actual tournament, as you will probably see in the differences between the two battle reports. 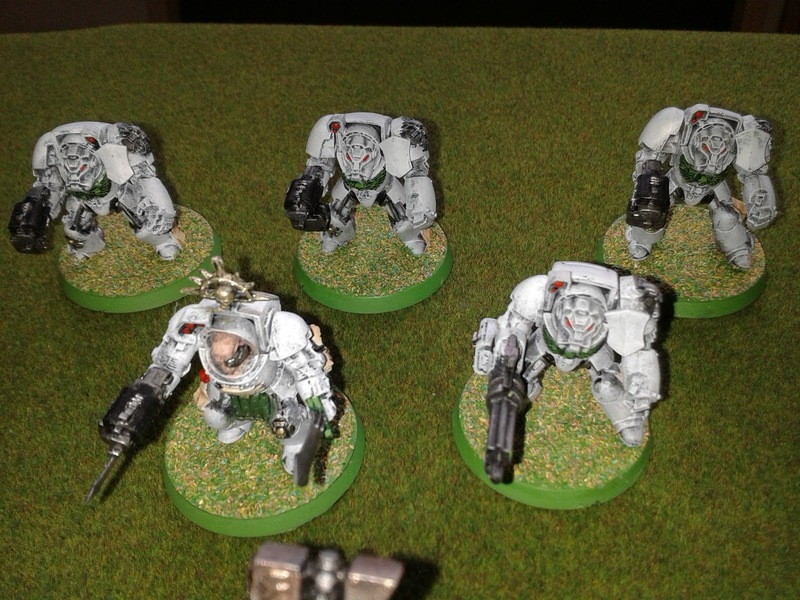 I now come to the final part of my Dark Angels army, having previously shown the Green wing and Ravenwing, now comes the turn of the elite 1st company, the Deathwing. My Deathwing were inspired by the Captain that featured in the 3rd edition codex that featured a white armour colour scheme instead of the traditional bone colour that the Deathwing wear. 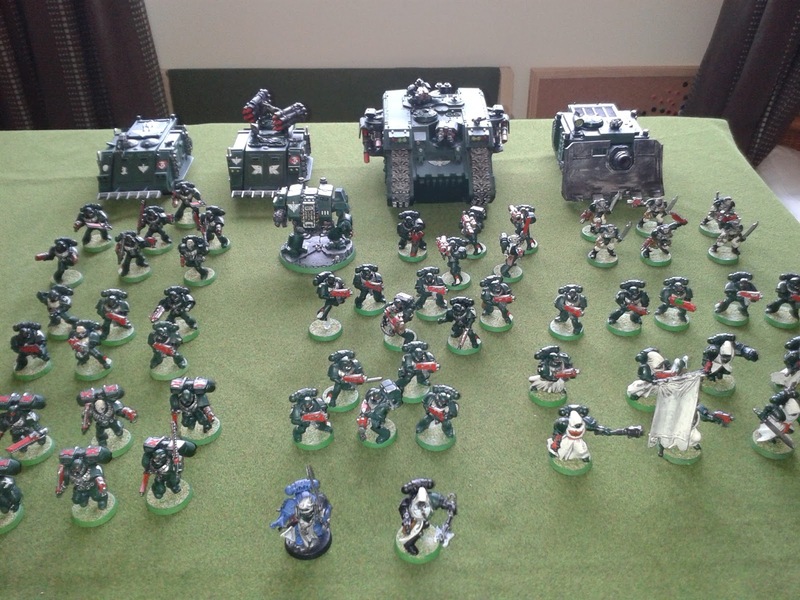 With the new codex about to drop, I thought I would spend a few posts showing my very own Dark Angels army. 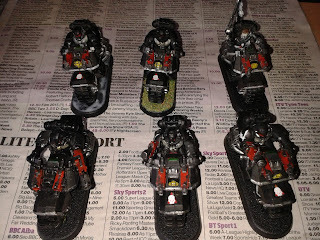 Yesterday, I covered the so-called Dark Angels Green Wing, today, it is the turn of the enigmatic second company of the Dark Angels; the Ravenwing. 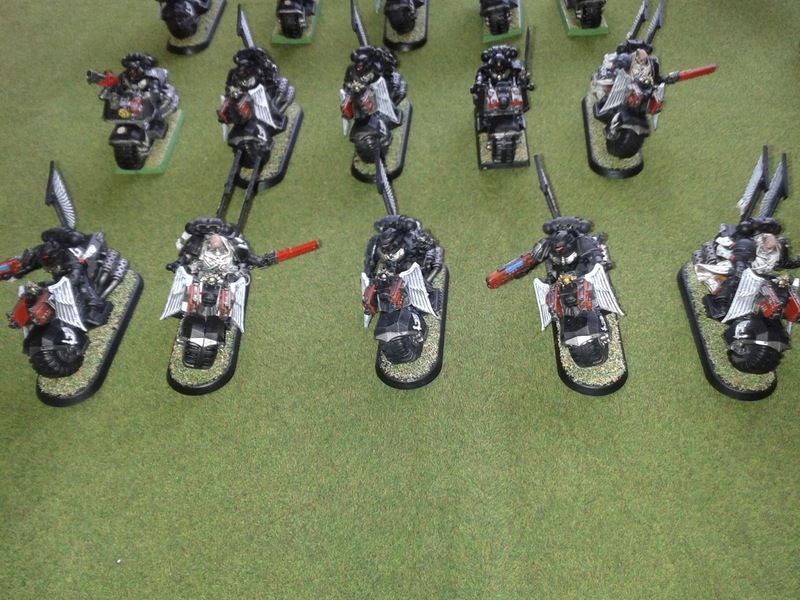 My Ravenwing army came about by pure chance. For years, I had only a single squad of bikers and a landspeeder as the representatives of the Chapter's fast attack force. 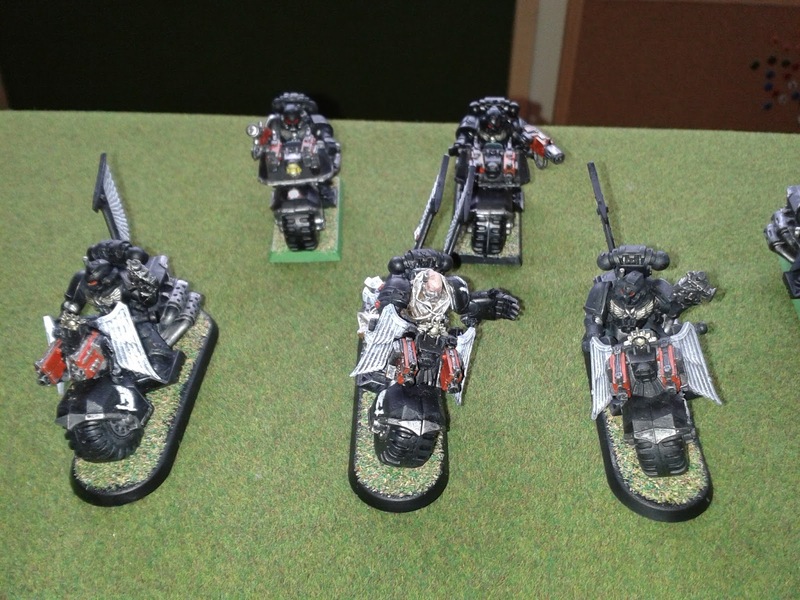 The bike squad was purchased when the first Ravenwing upgrade sprue was released, but they had not been added to due to the expense of fielding an all bike army. With the new codex about to drop (already pre-ordered mine! 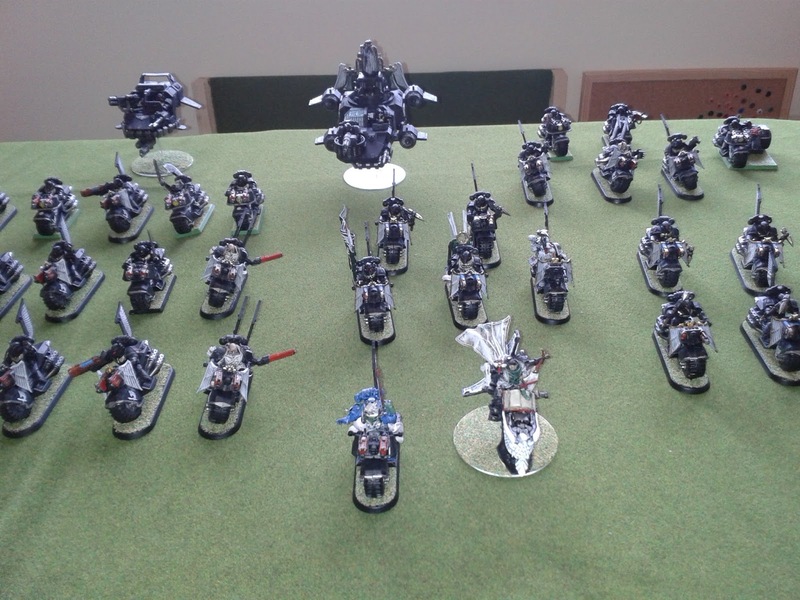 ), I thought it might be time to show my own Dark Angels army. 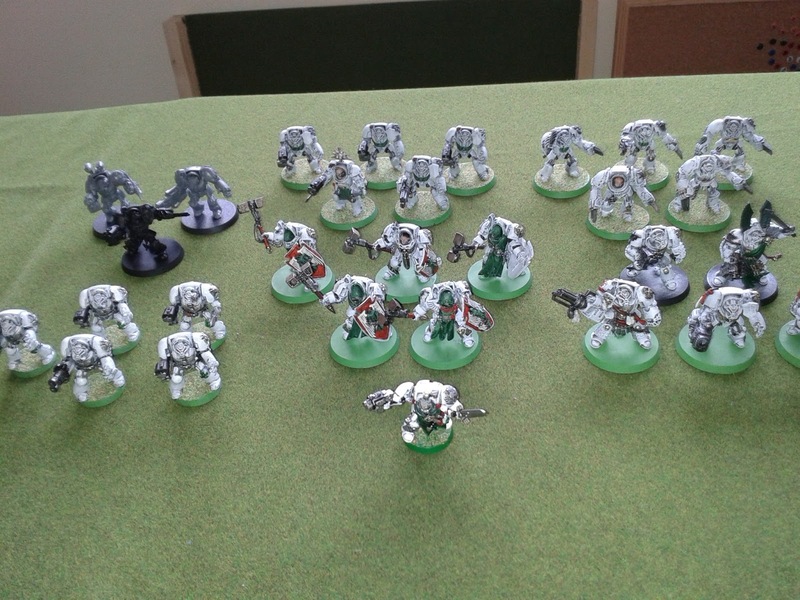 Today I will be focusing on the main body of the Dark Angels army, commonly referred to as the Green Wing. The army arrayed for battle. 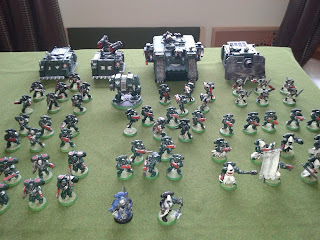 Dark Angels were my very first Warhammer 40k army. It all began with the contents of the 3rd edition boxed set, a tactical squad and a landspeeder. 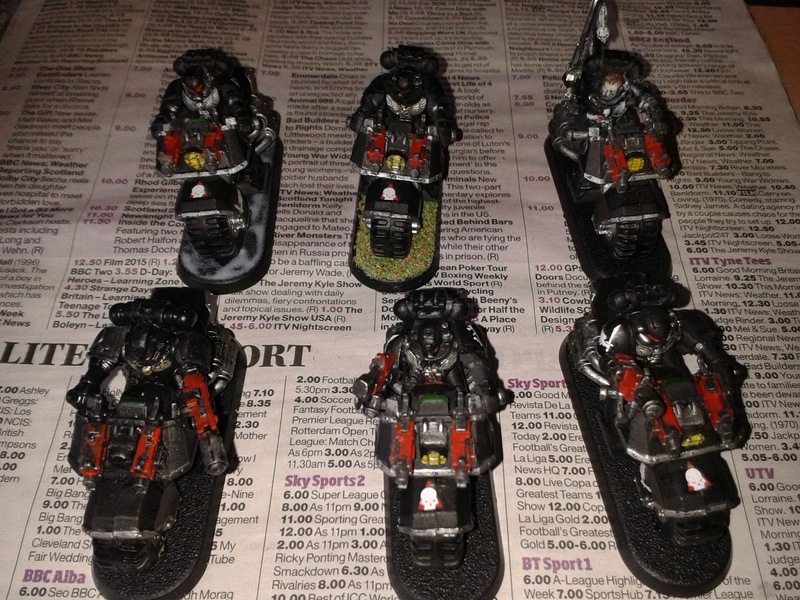 I chose the Dark Angels as I had seen the army in White Dwarf several times and liked the colour scheme, as well as the different coloured armours for the Ravenwing and Deathwing. My collection has been expanding with each new edition of the game and I was happy to see the original chapter get some love from the Dark Vengeance boxed set. There is a mix of classic models (check out the old school Rhino and Whirlwind) and some newer ones as the collection has expanded. Battle has ended for another year, the combatants shake hands and begin their slow journey back to distant lands. The ruins are more ruined. The trees stand bare, like autumn has hit them in one fell swoop. Hills lie barren and exposed, those madmen ranting about not earth underneath, but instead a white, fluffy packing material have been quickly silenced by the Inquisition. This year’s conflict has hit the battlefield hard, now begins the time to renew. Hi everyone, today I am here to talk to you about a yearly ritual that I have been observing for some time now. One of the strange things about attending a university gaming club (other than the fact I haven’t been a student for a long, long time) is that the club breaks for the summer. This gives me time to take stock of existing projects on the go or what I want to achieve in the next year. 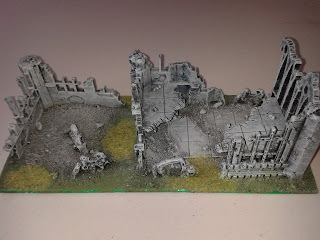 It also means that I get to do some spot repairs on the terrain in the club, to prepare them for the coming year of gaming. My terrain philosophy is to produce something that is functional and looks decent on the tabletop. 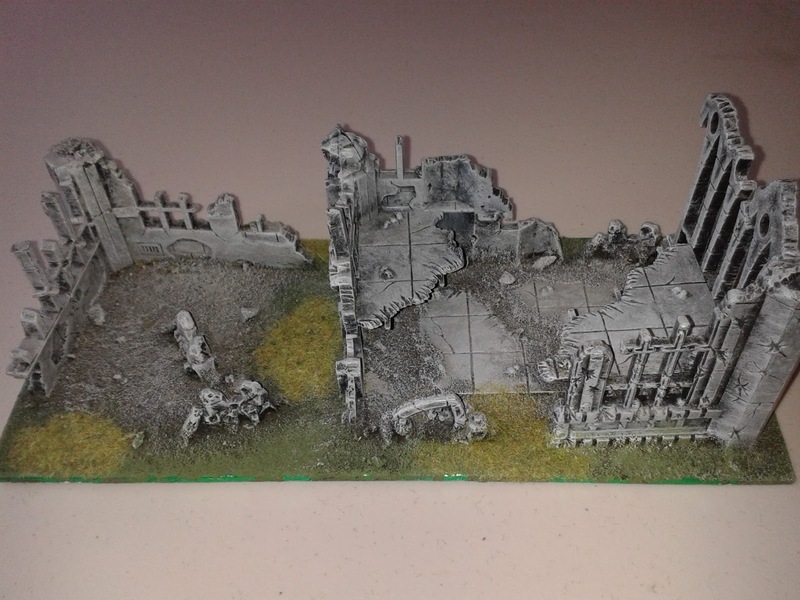 I don’t want to spend hours upon hours constructing intricate ruins, accounting for every brick that is out of place, only to have a terrain piece that is more hazardous to my own troops than the enemy (the dreaded wobbly model syndrome). I want terrain that is nice but that my models stand on, after all, they are the ones that get the most time and effort spent on them. It would be great (if a little unfair) to have terrain that swallowed up my units making me and the enemy forget about them until that crucial turn, but that is not what terrain is for. It takes long enough to pack up armies after a game without having to worry about scouring the ruins for an errant Ork that has been left behind (like a foul smelling and belligerent Macaulay Culkin). I finally got my new Space Marine codex in hand last night and spent an hour or so admiring some of the art and miniatures and having a look over the new rules. I'm not going to review the entire codex, there will be plenty of people doing that in the coming weeks, but thought that I would take a look at some of the changes that will most directly affect my most recent army; the White Scars. The new rules for mounted assault means that any bike-mounted independent character can turn your bike squads into troops. This is a change from the last codex where only a bike-mounted Chapter Master or Khan on Moondakken had the ability to do this. 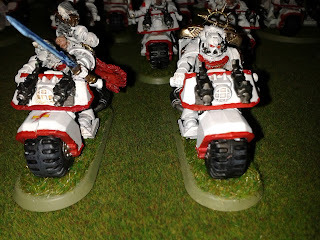 Want a White Scars army led by a bike-mounted Librarian bolstering his forces with arcane powers or a bike-mounted Chaplain inspiring his troops to victory (I just like the aesthetic of a Chaplain on a white bike, something about the contrast of black and white), well now you can! This now gives you access to a cheaper HQ unit if you want to cram even more bikes into your army. The other big change is that the bike squads no longer have to be a minimum of 5, but can be the standard minimum three instead. Whether this will lead to three-man grav bombs (2 grav guns and combi-grav) running around the board is anyone's guess. I will probably stick to 5-man squads (or even extend them) as even though bikes are still fairly durable, you want a couple of extra bodies available for casualties before you start to lose your special weapons. 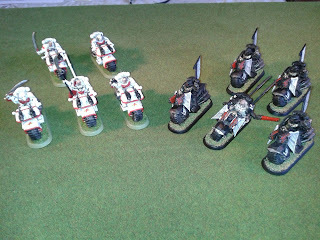 Having reported on all my battles from Blog Wars 9, I thought I would take the time to review my army and how it performed during the day. 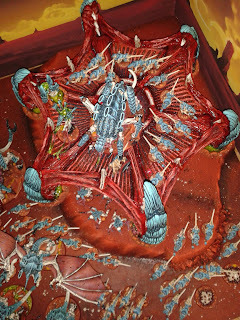 If you need context for the review below, follow the links to get the battle reports for my battles against the Space Wolves, Necrons and Space Marines. 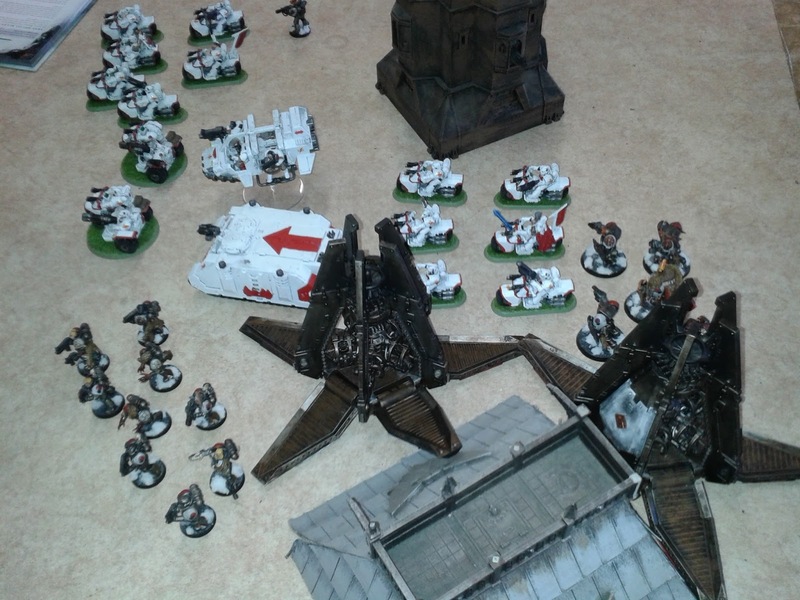 My Chapter Master had the standard internet load out; bike, artificer armour, power fist, shield eternal and auspex. I liked the Chapter Master, his 2+ save, 3+ invulnerable and eternal warrior did field a lot of wounds that otherwise would have resulted in dead bikers. He managed to get into combat in all 3 games, but only in one did he make a difference. In the first game, he failed to kill my opponent's wolf lord (who was on one wound) and killed a few destroyers and immortals on my game against the necrons. In the third game, he managed to kill most of a unit of Sternguard and his orbital bombardment took out the enemy warlord and a Centurion. He only survived the final game, running off the board in the first and being killed in the second. His warlord traits were very useful in the first and third game (infiltrate and fearless, respectively). Overall, he was a powerful unit, but I don't think I used him to optimal effectiveness. I tended to keep him out of combat, where he probably should have got stuck in more. I would probably take him again in the army. There were some fantastic armies on display for blog wars 9. Some examples are shown below (albeit in my shoddy photography skills). First up was Dave Weston's amazing tyranid army. Dave ended up taking the prize for best army and best character. 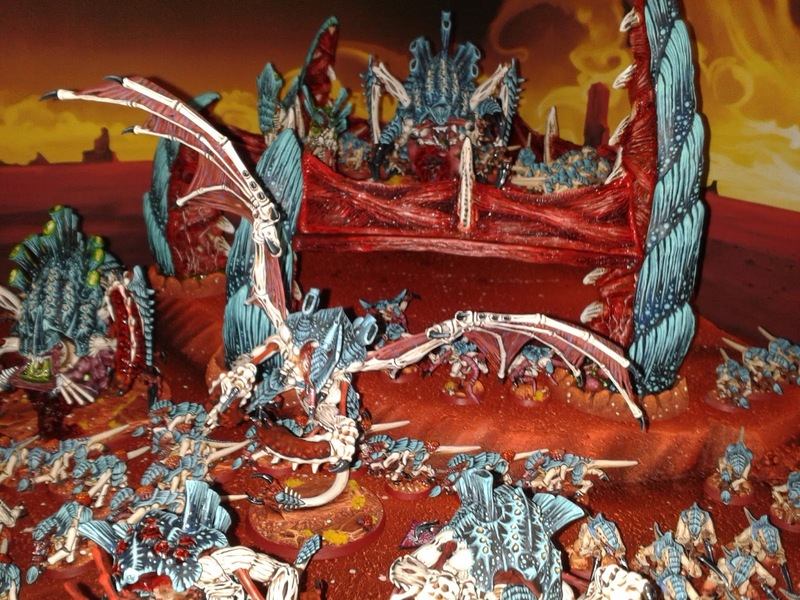 You can check out more of his army on his blog. When I arrived in Stockport for blog wars on Friday, I met up with Luke, Peter and Daniel for some practice games. Luke and I squared off against one another as he wanted some practice with the Maelstrom mission against a fast moving force. It was a fantastic game, which I will write up at a future point. Imagine my surprise when I turned up for my third game on table 8 (luckily, I didn't have to move!) and it was against Luke's great Howling Griffons Space Marines army. This was going to be really interesting. We both knew what to expect from each other's armies and had a very close first game against one another, would this game turn out the same? His warlord trait game +1 to seize the initiative and re-roll of reserve rolls (which we both forgot about). In addition to Coteaz and his re-roll, the chances of seizing were quite high. 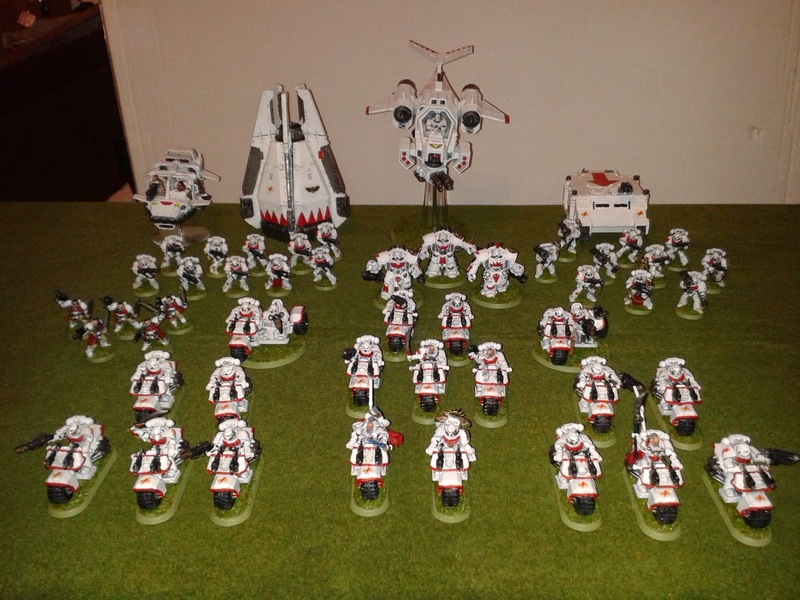 A lot of small units for grabbing objectives and some serious firepower. 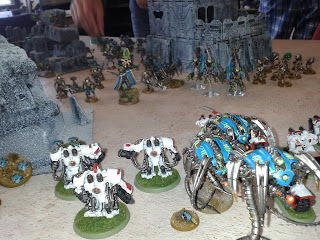 Game two was against Ben’s Necrons in a Decurion detachment on table 8. I have not played Necrons since the new codex came out, but had read all about the durability of the Decurion detachment, so was expecting a tough match. The mission was a modification of The Relic. There were 3 objectives; one in the centre of the table and one in each of our deployment zones. 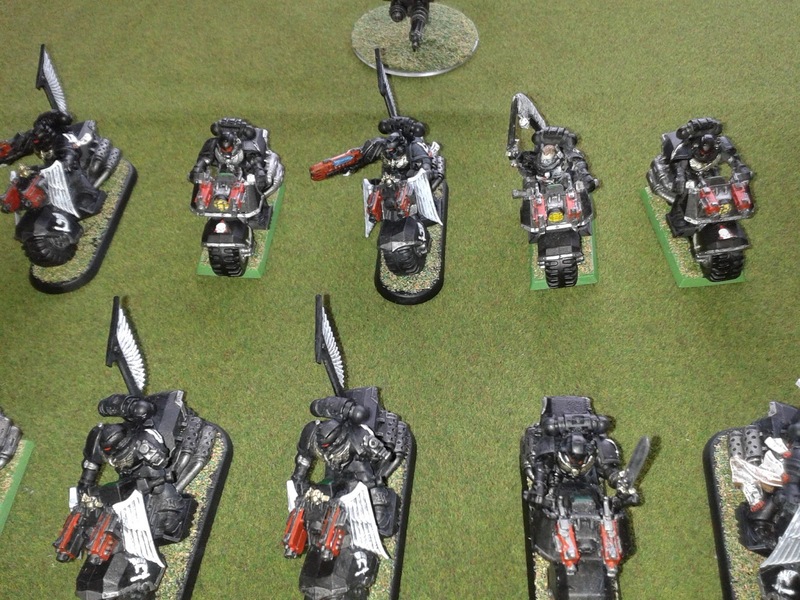 Your own objective was worth 5 points, the centre was worth 10 points and your opponents was worth 15.
a unit of Lynchguard (L) and Nemesor (N). Seeing them arrayed, that was a whole heap of necrons to try and kill. I set off early in the am to the distant land of Stockport. I had a car packed with mighty warriors, eager to sell their lives for victory, along with a long drive's supply of power ballads (I wanna know what love is!) and pockets full of my strange, foreign money (the most fun you can have in England is trying to buy things with Scottish money, I occasionally throw in monopoly money, just to see if they notice). This was my first foray to Blog Wars and I was looking forward to seeing how I got on. My last tournament gave me one win, one loss and one draw, I was eager to see how my fortune would change. 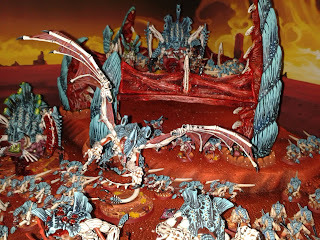 Unfortunately, due to the time constraints of the tournament, I was unable to take sufficient notes for a full battle report, but will give an overview of the battle with plenty of photos. 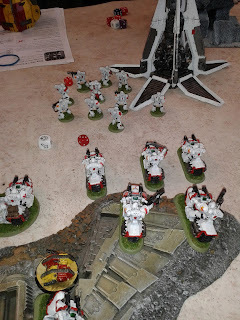 Arjac Rockfist (A) and 4 terminators (T)- mix of thunder hammers, storm shields and combi-meltas in drop pod (DP1). 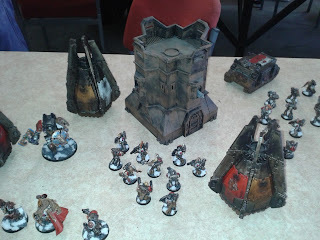 This week at Dundee Wargames Club, I played a battle against Pete's Astra Militarum army. I had previously played Pete's Harlequin army, so it would be interesting to see how the Guard fared against the White Scars. We played 1500 pts on a 4 foot by 4 foot board and rolled up Emperor's Will for the mission (one objective in each of our deployment zones). 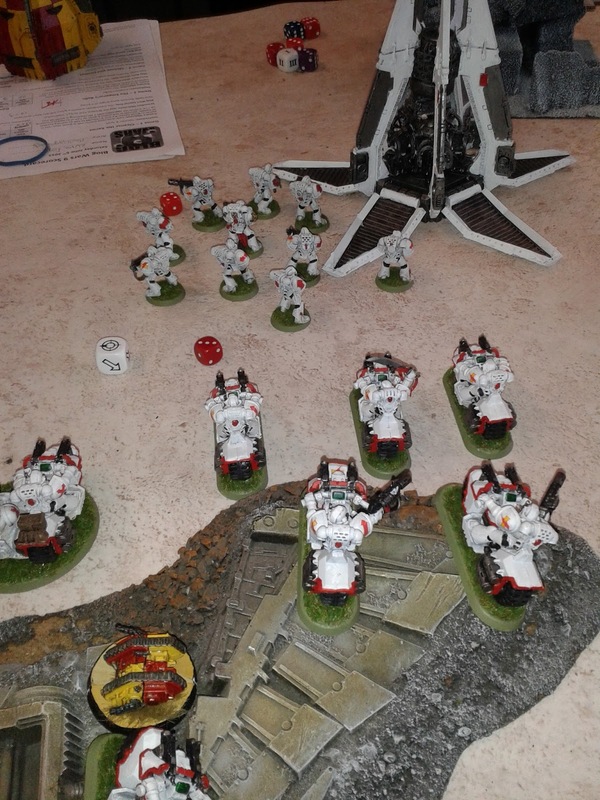 This would be my last game before blog wars, so I wanted to run my White Scars again for the game. 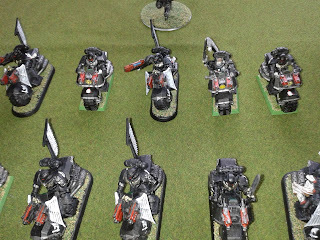 After blog wars, I think I will run a different army for a while, maybe my Orks or Guard (or even get the Vampires out for some fantasy gaming). The battlefield had a trench line running along the centre, with some ruins in each deployment zone and one in the middle besides the trenches. There were a few craters scattered around the board. The set up looked interesting, some cover for the shooting elements of our armies but plenty of open space to manoeuvre and for gun lines. 10 Tactical Marines- Meltagun, sergeant with combi-melta and melta bombs (TM) in drop pod (I forgot to include this when making up the maps). My warlord rolled on the Personal table and got the one which gives an extra victory point for each enemy character slain in a challenge (very useful with all the sergeants running around). My plan was to take the first turn or two to focus on the enemy armour and eliminate it. I know how much damage Guard tanks can do to marines. 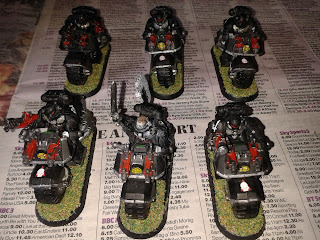 With the armour out of the way, I could hopefully rely on the toughness of the bikes to take out the guardsmen and hold the objective in the enemy's deployment zone. I would definitely be outnumbered, but with any luck, my tougher troops could hold out against the massed guard firepower. Got back today from Blog wars 9 (that was a long, long drive!). Had a fantastic weekend of gaming, lots of excitement and close, harrowing games. It was a great event that was very well run and very enjoyable. Well done to Alex (from From the Fang) for putting on such a brilliant tournament. Many thanks to my opponents on the day, all were a pleasure to play against. I will be posting photos and battle overviews from my games over the next couple of weeks, as well as photos from the armies that were on display. It was nice getting to meet everyone whose blogs I have been following for a long time, I can now put faces to a lot of the names. 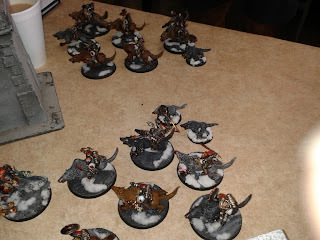 I also got some nice compliments on my army, objective markers and the blog, which was definitely appreciated. Many thanks to Luke, Peter and Daniel for keeping me company and for the practice game on Friday night (see Luke, who said that meeting up with a random guy you met on the internet always turns out badly?). Hopefully, I will be able to make the journey for blog wars 10 in November. Today is blog wars 9! My car is packed with a display board, dice, books and White Scars eager for battle. Good luck to everyone for the event today, sorry in advance for my surly pouting as your army stomps across mine with as much resistance as polystyrene to spray paint. 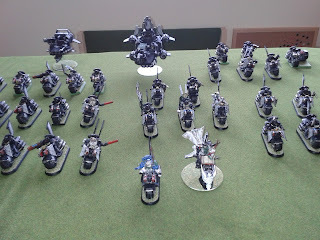 My Dark Angels have scrambled over the battlefield, searching for errant scraps of paper. My Orks have scoured the board for wayward Gretchin. My Guardsmen have surged forward, eager to reunite with their unpainted brethren. My armies have fought over a large and varied number of objectives over the years. 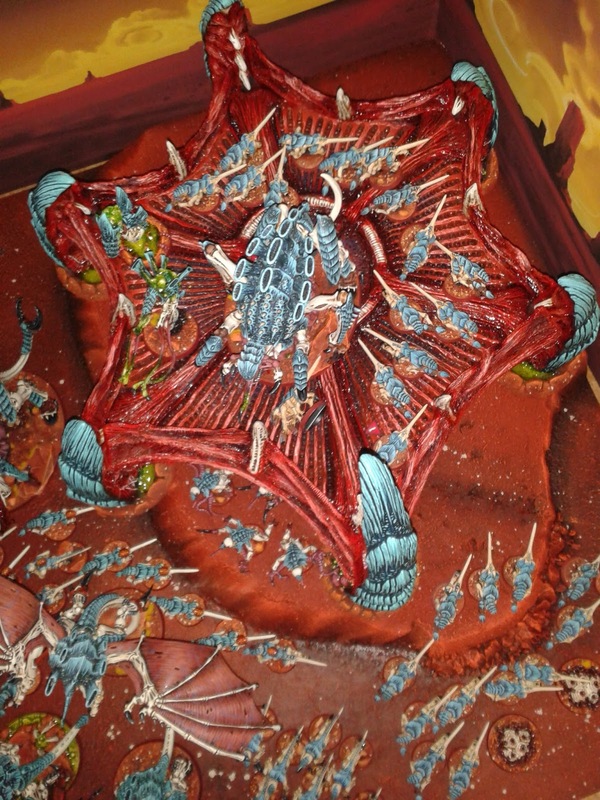 From my initial forays into 40k, where the objectives were ripped up sheets of paper with victory points written on them, to using spare models that were not involved in the game to represent points of interest on the board (this last one in particular can get tricky if you forget these models are not involved in the game and accidently try to assault the objective). More than any other edition of the game, objectives are a big deal in 40k. Now, what has this got to do with anything? you may ask. I decided it was high time to get some proper objective markers made up. 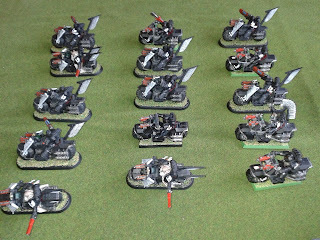 This was during my Imperial Guard phase, so the objective markers were themed around my guard force and painted up to match their colour scheme, but will work for any of my armies. I don’t know about you, but I find it much more exciting to fight over a communications array or some supplies, rather than over unpainted models or different coloured dice. These objective markers were made from the spare bits and pieces that tend to go unused over the years from different boxed sets or vehicle accessory sprues. They do have a slight sheen to them though. After I applied the numbered transfers (for use in maelstrom mission), I decided to give them a coat of purity seal to help keep the transfer on and help stop damage to the paint. For some reason, this resulted in the models getting a nice, white sheen so that all my battles now appear to take place at dawn on a nice winter morn, so that all my objectives have a nice layer of frost on them. Oh well, if everything was easy……. Here are all six objective markers in all their glory. After a flurry of painting in the past few weeks, I finally managed to get my army for blog wars finished. 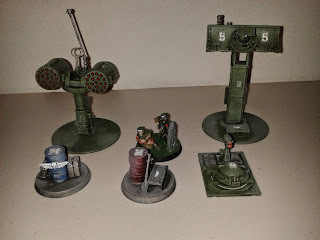 The army has seen some modification from my previous post, thanks to some playtesting and advice from some fellow gamers (many thanks to the fine folks on 40k Addicts facebook group for their tips). Blog wars army arrayed for battle.